This edited article about the Apaches first appeared in Look and Learn issue number 495 published on 10 July 1971. Al Sieber, the legendary Chief of Scouts through most of the Apache Wars, grinned at the eager young newsman’s question. It was an evening in 1906, and the old Indian fighter was giving a rare interview to the Press in the bar of a hotel in Globe, Arizona. Massai, the last fighting Apache! Massai, who jumped from a prison train carrying him to the swamps of Florida and walked 1,500 miles back to his homeland! Massai, who at one time had several thousand soldiers and civilians after him! Until 1959, when his daughter, Alberta Begay, revealed new facts about him, his life was a mystery, now it is more like a miracle! It all began back in the 1860s in Arizona, the homeland of the Apaches, who loved the spectacular mountains of their country, but could live in its deserts like lizards, could run 40 miles a day in the burning sun and ride like furies and fight like fiends. Massai’s Apache tribe was the Chiricahua. His father taught him to use a bow, a gun and a spear. He trained him to run for miles with water in his mouth and not swallow it, not just as a discipline but because it made him breathe properly. Massai also had to run with a load on his back, yet another stage in the making of an Apache warrior. He had one close friend called Gray Lizard, whose parents had come from the east and settled with the Apaches. One day the two boys met the famous war-chief Geronimo who, in the 1870s, after the main wars were over and most Apaches had been forced on to reservations, was determined to keep up the struggle. Geronimo was giving orders. All over the Apache homeland and beyond it hidden dumps of ammunition, clothing and food must be located to prepare for the hit and run raids of the future. 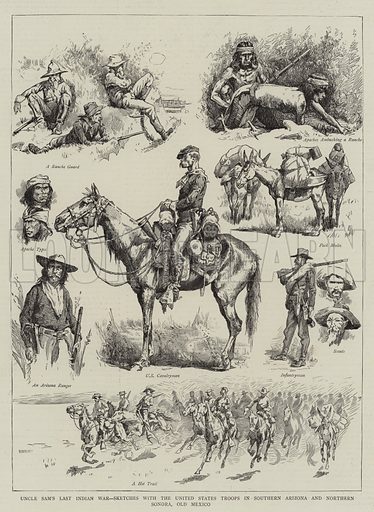 Massai and Gray Lizard helped organise such dumps, then, when nearly all the Apaches were forced on to the dreaded San Carlos reservation with its terrible heat and unhealthy climate, they were among those who broke out from time to time and went on the warpath. Anything was better than San Carlos. Later, Massai and Gray Lizard were moved to a healthier reservation and Massai got married and settled down. In the final Apache outbreaks of 1885-86, he had no part. Much good did it do him! After the final surrender it was not only Geronimo’s band who were sent to rot in Florida. The Americans treacherously sent their loyal Apache scouts to captivity and hundreds of peaceful Apaches – like Massai. No Chiricahua was to be left in Arizona. As the prison train left his beloved homeland, Massai decided to escape. For three days he and Gray Lizard worked at the bars of their window whenever the guards were not looking, then, on the fourth day, somewhere east of St. Louis, Missouri, their chance came. The train was slowly climbing a scrub-covered hill. Bidding farewell to his wife and child, Massai, with Gray Lizard, jumped through the window, rolled down the hill and hid in thick vegetation. When their escape was discovered, his wife was to describe him as a huge man, though actually he was slight and wiry. The two Indians, travelling always by night and steering by the stars, started on their 1,500 mile journey. No white man saw them, but they stole some white miners’ rifles and ammunition. Back in the West, the friends parted. Gray Lizard was not a wanted man, not being a Chiricahua, and he went to live with other Apaches. But Massai was wanted, and the word was out to get him. They were looking for a giant! Three regiments of cavalry, countless Mexicans, and white, red and black scouts were after him, but the most anyone ever saw of him was a footprint or a sudden rustle of leaves; anyone, that is, except some of his fellow Apaches, whom he could trust. Even Al Sieber himself and his crack scout, the half-breed Mickey Free, never got near him, except on one occasion when Mickey met him at a camp of Apache exiles in Mexico. As it was neutral ground all the scout could do was have a talk about old times! Soon every killing in Arizona seemed to be blamed on Massai, yet though he killed, it was only to save himself. He married again, which Apaches could do, carrying off his bride by strapping her to a horse. The rough wooing worked. He gained a devoted wife prepared to live on the run, and they had four much-loved children. Until his daughter spoke, no one knew how the Massai story ended. The file on him was never closed. Had the Apache wolf finally been killed? Had he settled in Mexico? The confusion arose because his enemies not only did not know what he looked like, but also thought he was tall. What happened was that about 70 years ago – the Massai family naturally could not date the event exactly – a strong posse of whites looking for outlaws cornered the fugitives. Massai could easily have saved himself, but he was not the heartless animal of legend. He told his wife to take the children and herself to a Mexican friend for a day or two, then travel northwards by night to her own Mescalero Apache reservation and settle there. Just before dawn, Massai slipped away, his rifle in his hand, his Colts and bow and arrows in place. Soon after his son slipped away. Their mother refused to leave until she had seen Massai’s body. All that day the hunters scoured the woods, then they lit a great fire. The following morning they were gone. Massai’s wife and eldest boy went to where the fight had been, then returned. Before they headed for safety, she told her children how the white men had burned Massai’s body. All that was left were a few bones which she buried and the buckle of his ammunition belt. The children looked silently at this last relic of the last fighting Apache, holding back their tears, Indian fashion. Then they started on their long journey.